FileTables are a new feature in SQL Server 2012. They are layered on the existing FILESTREAM functionality. FILESTREAM is designed to allow large objects, such as images and documents, to be stored logically in a column in a database table, but physically in a file in the operating system. This keeps large objects outside the database, keeping the size of the database down and also allows the files to be accessed directly by client applications reducing overhead. FileTables in contrast allow SQL Server to manage a whole folder in the Windows file system including all the sub folders and files in that folder. The benefits of this is that from a client application perspective the files are exactly the same as those stored in the normal file system and can be directly accessed by standard programs such as Microsoft Word. 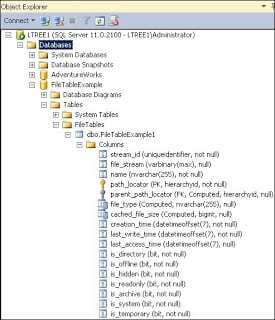 From a SQL Server perspective the files and folders can be accessed and manipulated using T-SQL just as if there were stored in a table. Other advantages include the ability to directly index the contents of the folder using the full text indexing facility in SQL Server. Files can be manipulated using T-SQL INSERT, UPDATE and DELETE (or any other T-SQL). Folders are dealt with in a similar way. Files and folders can be managed in T-SQL and using the normal File System in Windows. The best of both worlds.